First off, sorry for the slight delay in my posting schedule. I’ve been a little busy lately (and some of it is due to DD stuff which will pay off later), so in the news department, I’ll just direct you to the Marvel Psych Ward link I posted earlier as well as to the Mondo Marvel panel at Comic Con International in San Diego where Joey Q made a couple of Daredevil-related comments. 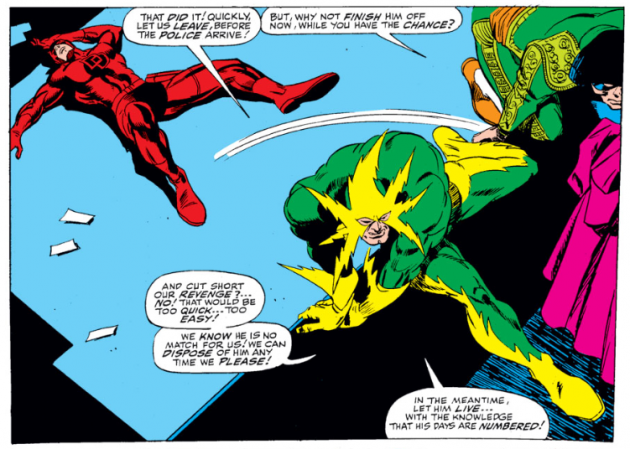 Daredevil versus disgruntled baddies Electro and the Matador, both of whom have been mentioned in this category before. Later on in this issue (by Stan Lee and Gene Colan), the first Daredevil annual from 1967, Daredevil will also encounter the Gladiator, Stilt-Man and Leap Frog. Ah, this time Daredevil is really just faking it, taking a break after being zapped in the shoulder by Electro. This adds to the humor of the situation as even the hero himself is surprised by the villains’ departure and had counted on them getting closer. But Electro and the Matador don’t know that Daredevil is not quite as unconscious as he appears to be and seem content to just leave him helpless on the ground, though still very much alive. When even the relatively pacifistic Matador (see his and Daredevil’s earlier encounter) questions Electro’s decision to move along, you know there’s a problem: “But, why not finish him off now, while you have the chance?” Exactly. Good question. However, Electro seems to have the same problem as he did before. He’s like a cat who wants to play with his prey before he kills it; except that he also has to dress it up in sequins and fancy party hats. Everything has to be spectacular with this guy. Which, if I may consult my inner amateur psychologist, suggests that he’s really just very bad at committing to anything, and dreads having to make a decision which forces him to come up with all these excuses for why things can’t be accomplished in the here and now. Well, I guess we should all be grateful since ol’ hornhead is still with us. Didn't they actually hinted at Electro being gay in a recent series? I'm thinking it was in Marvel Knights Spider-Man by Mark Millar, but I am going to have to go back and check. I love Electro's pathetic reasoning here. I guess you'll probably get round to it, Christine, but I think my all time favourite villain delayed gratification is the extremely convulted episode involving Mr Hyde and the Cobra, for no good reason, traipsing Daredevil off to a Lighthouse or somewhere or other in the middle of the sea instead of just bumping him off. Can't remember the exact issue but it's priceless!